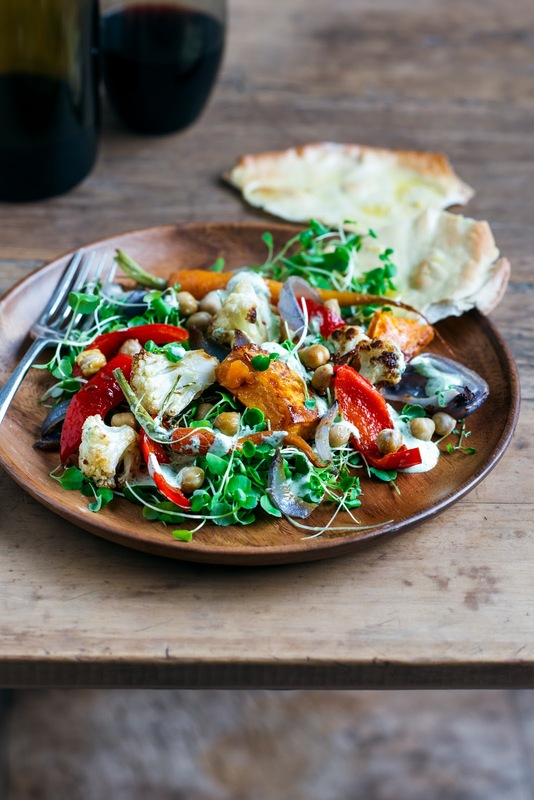 Morning all – well it’s been a while ‘between drinks’, but this is a great little vege-loaded mid-week recipe which is super healthy and pretty quick and easy to put together. During winter I often crave big hearty stews or pies (…see recent pie extravaganza), and when I need a vegetable fix I usually go for soup, (check out loads of soup recipes in the index), but sometimes I like veges that you actually need to chew! 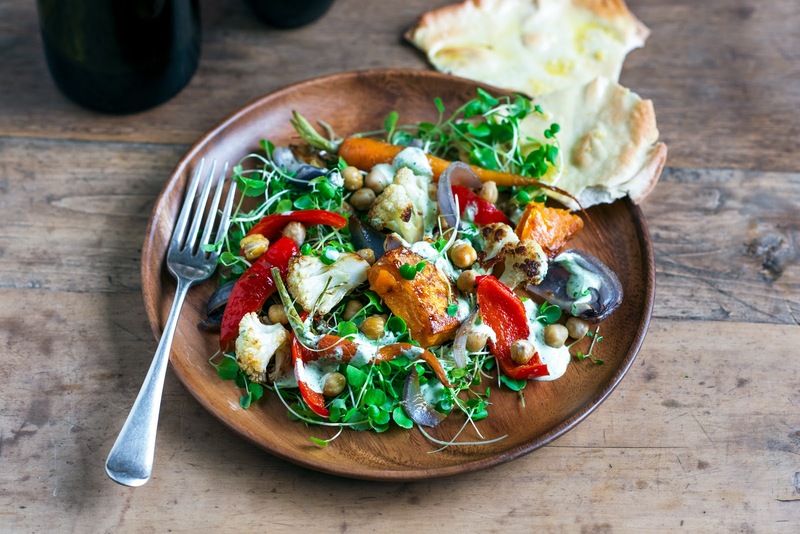 This salad is served warm – the carrots, kumara, cauliflower, red pepper, onion and chickpeas are tossed in honey, olive oil and cumin seeds before being roasted, so are sweet and fragrant, and a great contrast to the peppery watercress or rocket, then everything gets a mighty fresh lift with the creamy dressing of salty feta, a hint of pungent garlic, fresh coriander and zesty lemon. On the side 2-minute crispy garlic flatbreads act as massive, crunchy croutons. If you can’t live without meat feel free to serve alongside roast lamb, or topped with seared lamb loins… but to my mind it really doesn’t need it. (As you may have gathered I am probably 90% vego, but each to their own). 6 cups baby watercress or wild rocket leaves. Place all ingredients in a small food processor and whiz until smooth. Store in a sealed container in the fridge until ready to serve. This dressing also makes a great dip for crudites to serve with drinks. Makes about 3/4 cup. Preheat the oven to 180˚C or if serving with the salad, leave the oven on after cooking the vegetables. Mix the oil and garlic together in a small jug and brush over the flatbreads. Cook 3-4 minutes until golden and crispy. Wishing you all the best through this difficult time. What a beautiful salad so colourful. Feel free to swear as much as you need sounds like you deserve a good swear. I hope your little Dougie will be ok too. Just heard I'm bringing him home today – bit nervous as he needs a lot of care and medication…errp!